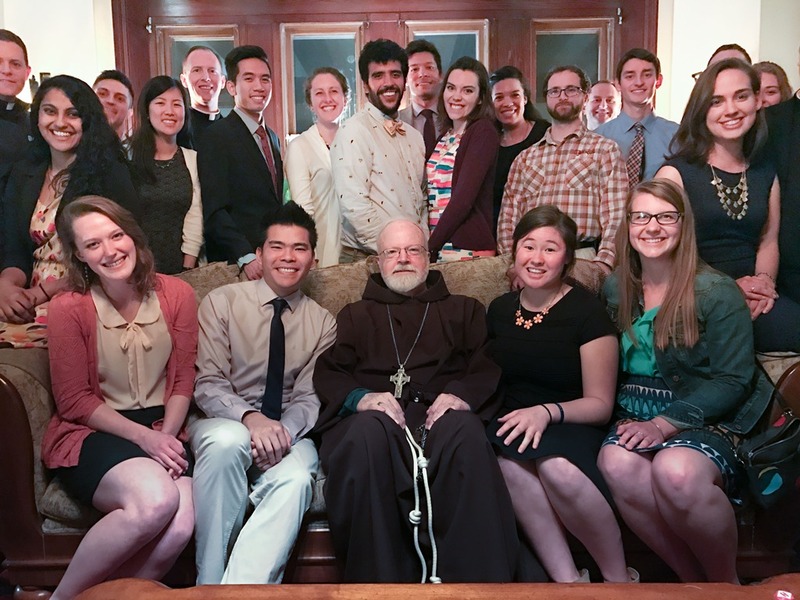 Each year we have a gathering of the Fellowship of Catholic University Students, or FOCUS, lay missionaries working in the various universities in the Archdiocese of Boston. 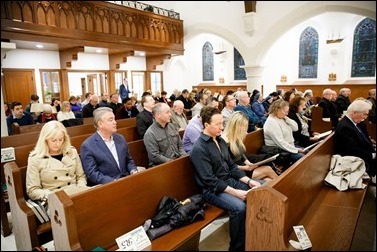 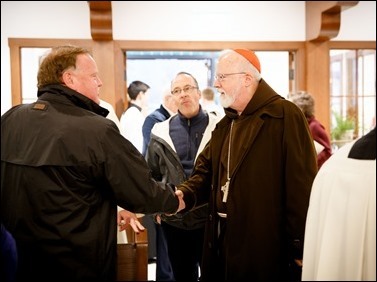 This year, it was held last Thursday evening at St. Mary’s Parish in Waltham, and hosted by Fathers Wayne Belchner and Eric Cadin, along with Father Dan Hennessey. 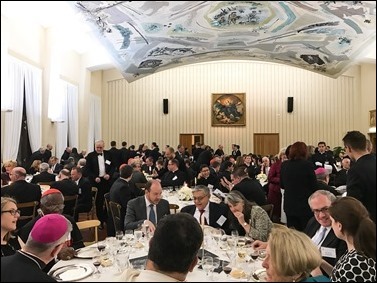 They updated me on some of their work and recent activities in their ministries at Boston University, MIT and Harvard, and then we shared a meal together. FOCUS is a wonderful movement that has had an extremely positive impact on campus ministry, not only in our archdiocese, but around the country. 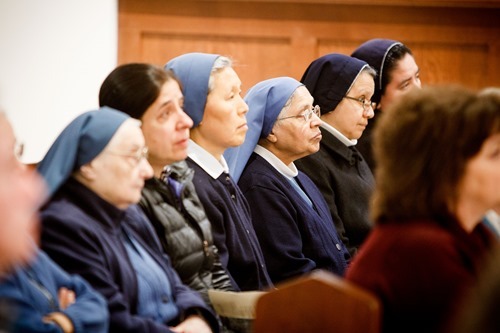 We are extremely grateful to have them here, and we hope that their presence will continue to grow. 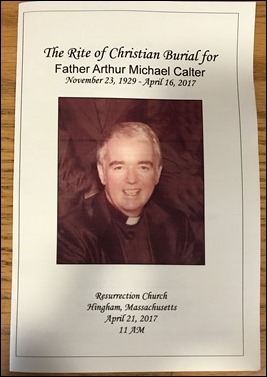 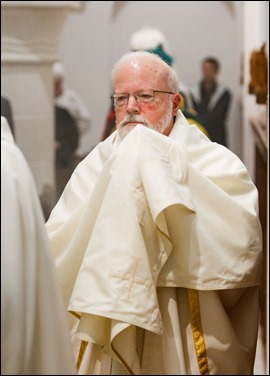 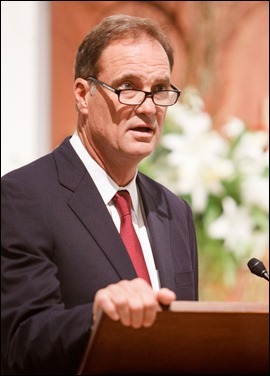 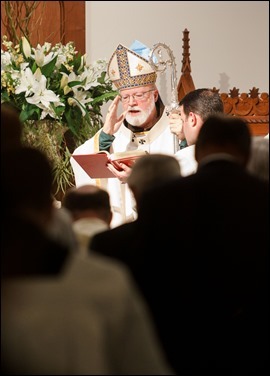 Friday morning, I celebrated the funeral of Father Arthur Calter at Resurrection Parish in Hingham. 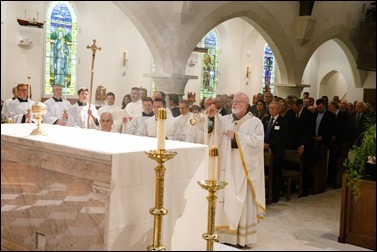 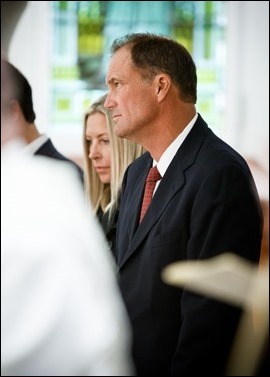 It was a very beautiful funeral, with many priests in attendance, as well as many members of his large extended family. 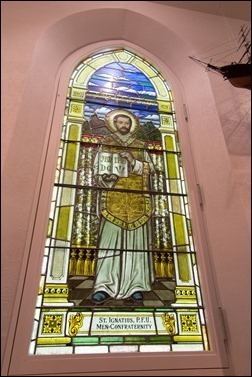 (Father Calter was one of five priests in his family.) 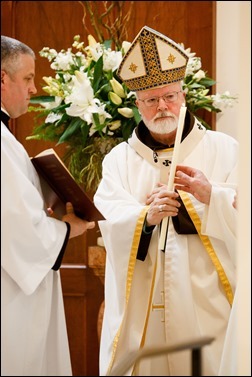 Also with us was Bishop John Dooher, who was a very good friend of Father Calter for many years. 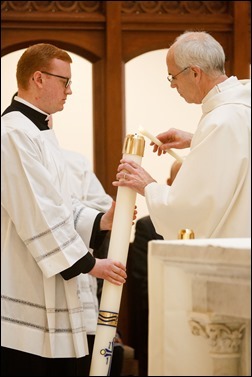 Father John Unni gave a very moving homily and Father Calter’s nephew offered the reflection. 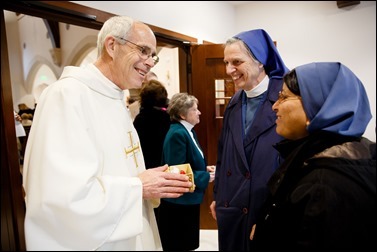 Both of them spoke of the many facets of Father Calter’s ministry, both as a chaplain in Vietnam and serving in parishes of the archdiocese. 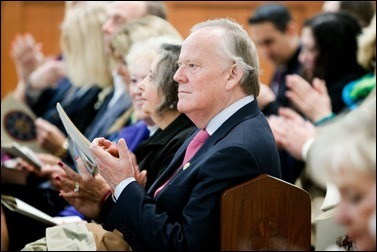 He had a long and beautiful life. 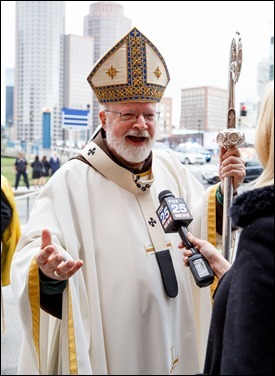 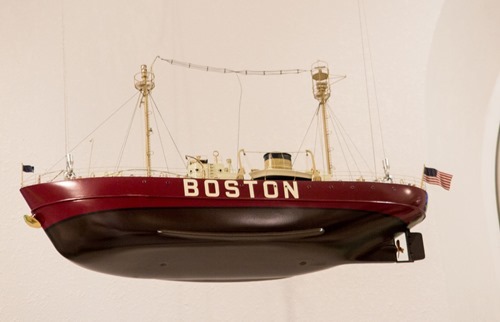 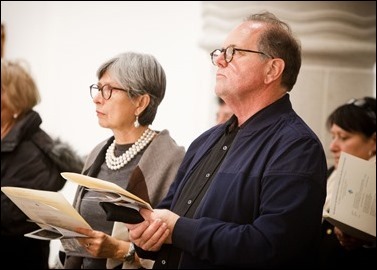 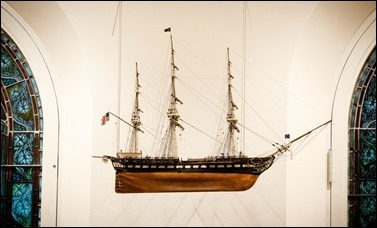 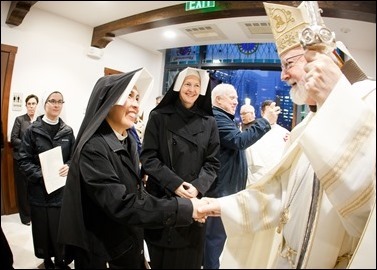 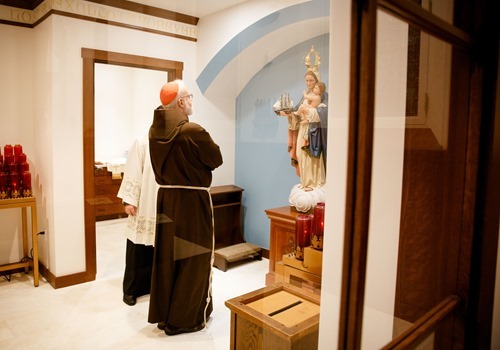 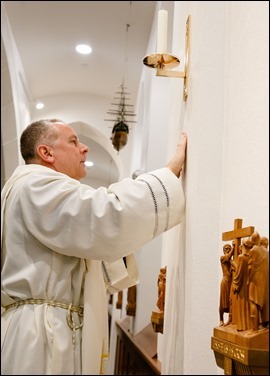 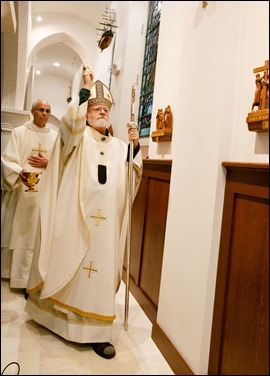 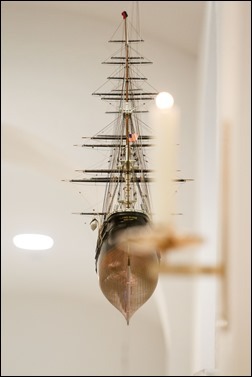 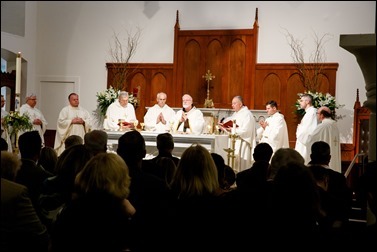 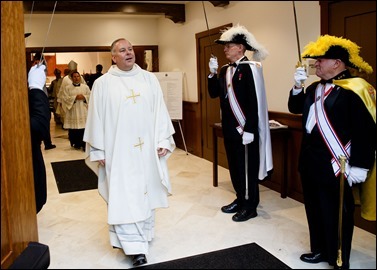 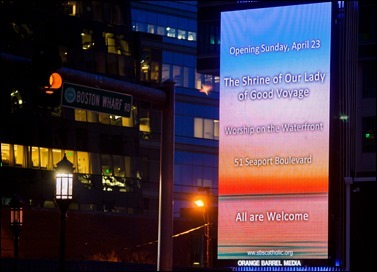 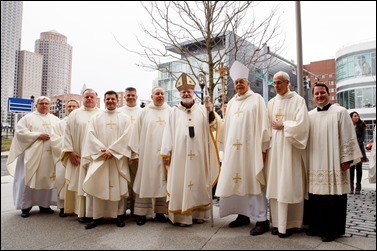 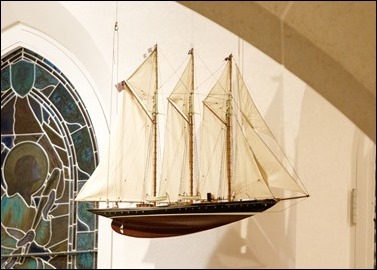 Then, on Friday night and Saturday we had the celebrations surrounding the dedication of the new Our Lady of Good Voyage Shrine in South Boston’s Seaport District. 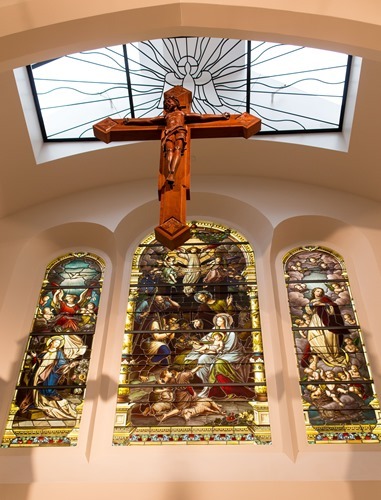 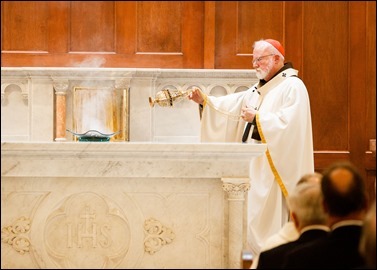 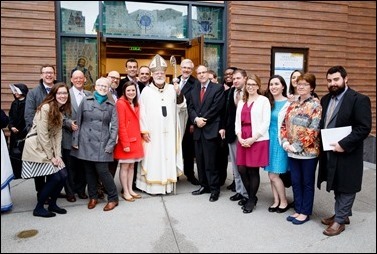 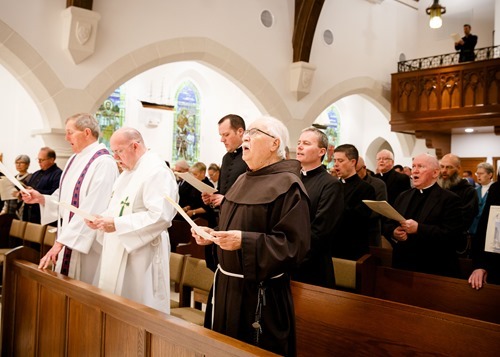 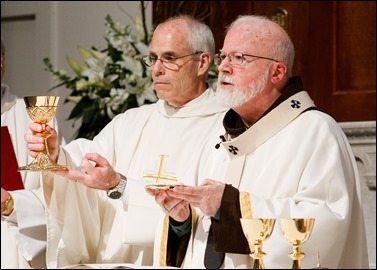 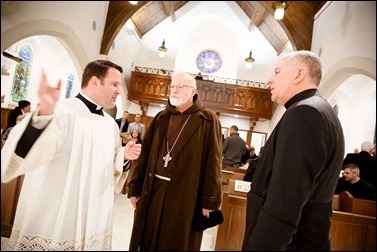 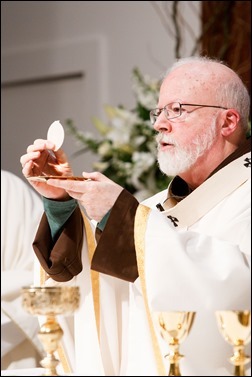 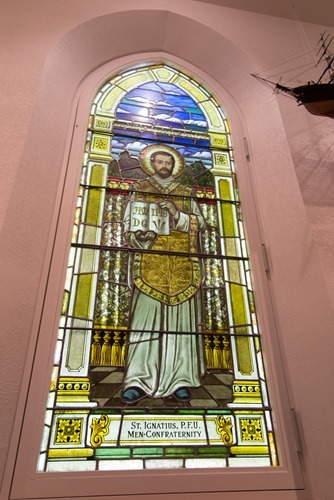 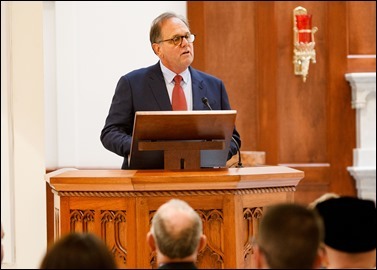 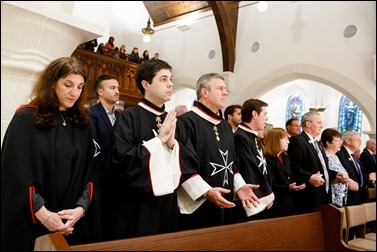 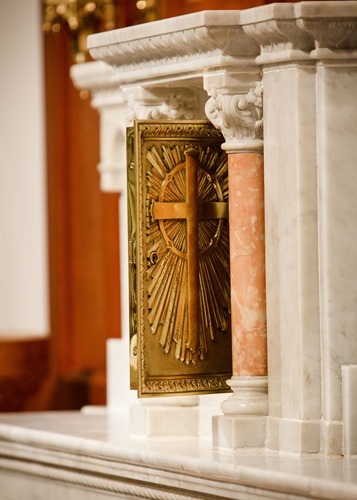 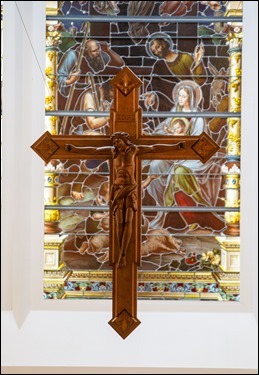 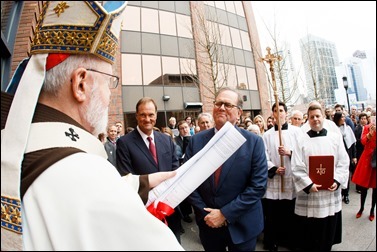 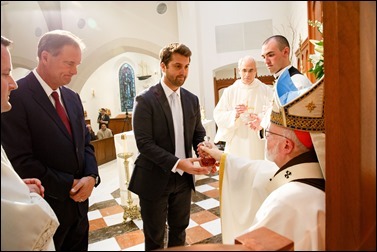 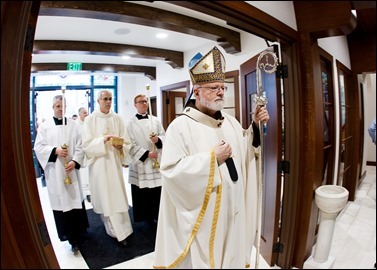 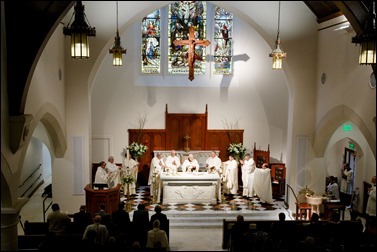 The new church is officially designated as a shrine, and the priests from the Pastoral Center have formed a pastoral team, under the leadership of Father Matt Williams, to be able to carry out the pastoral work there, with a special outreach to young people. 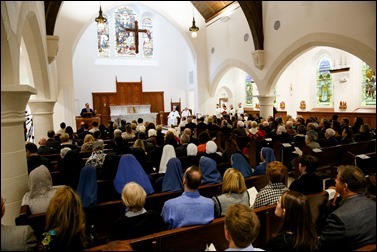 Because of the limited seating capacity of the shrine, we decided to hold two liturgies to give more people the opportunity to participate in this important occasion. 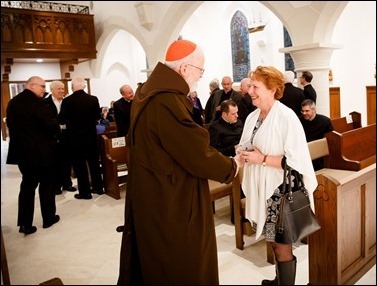 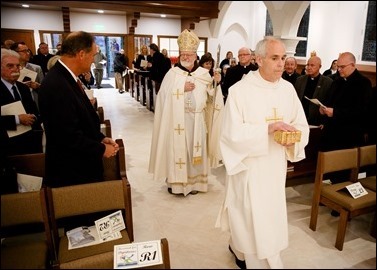 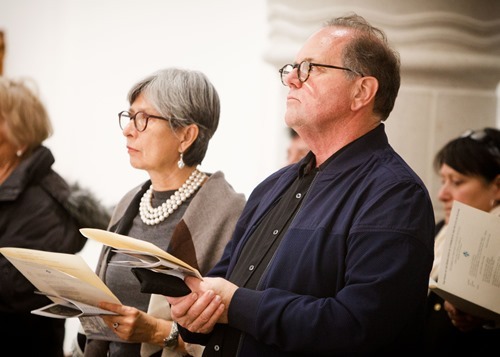 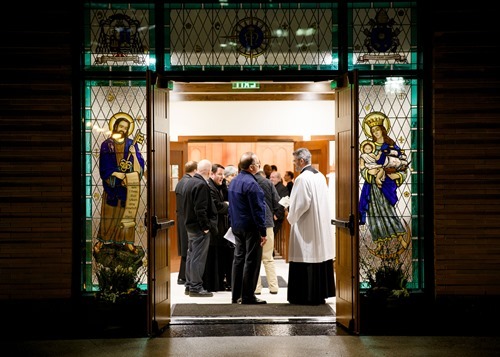 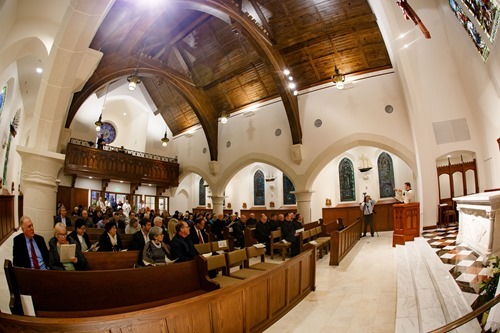 On Friday night, we held a Vespers service to which we invited priests, sisters, archdiocesan staff, workers, planners, local parishioners and others who were involved in the planning and construction of the new shrine. 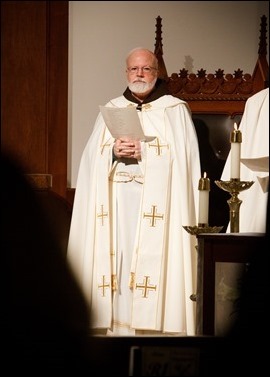 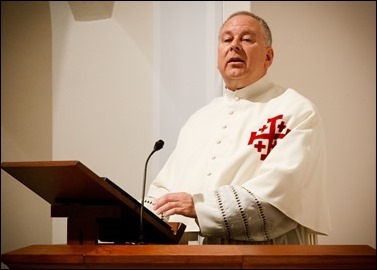 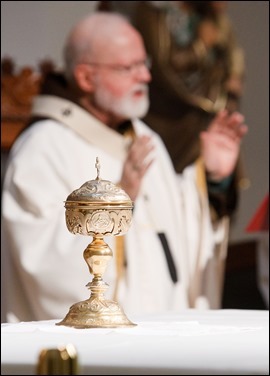 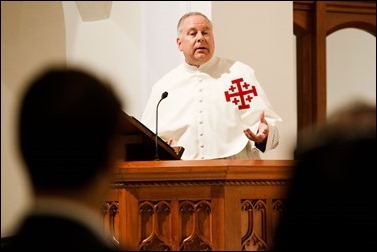 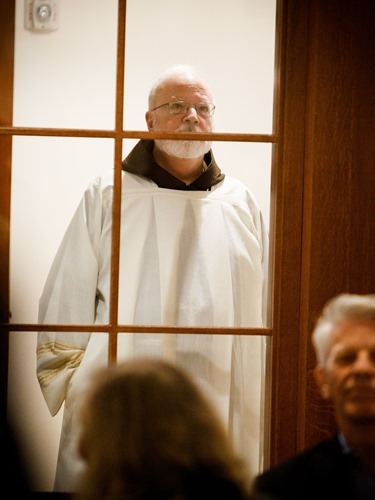 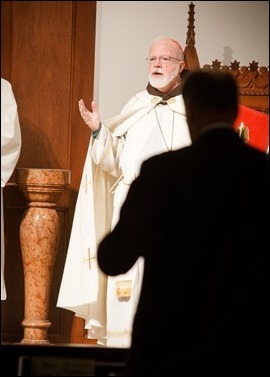 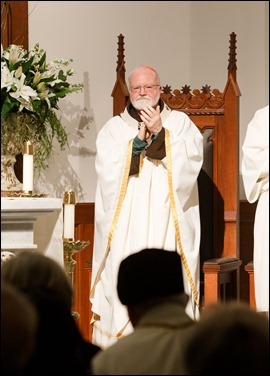 The rector of the shrine, Father James Flavin, preached the homily for us at the vespers. 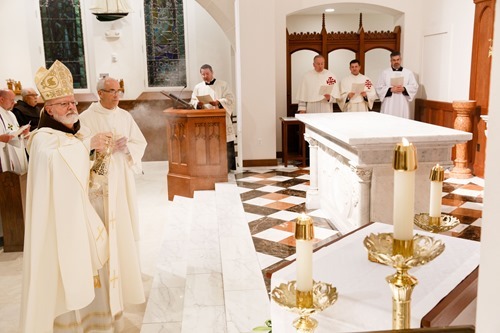 Then, on Saturday, which was the anticipation of Divine Mercy Sunday, we celebrated the Mass of Dedication and Consecration. 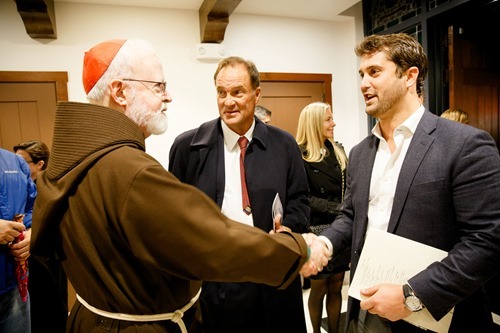 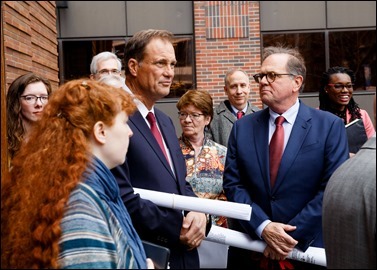 There were many people on hand for the event, including the interior architect, Ethan Anthony, and the developer, John Hynes. 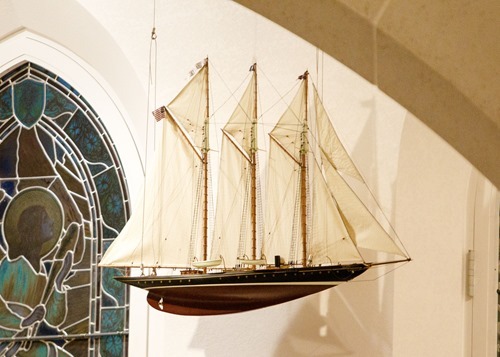 Before the Mass, Ethan Anthony offered some remarks explaining the nautical symbolism expressed throughout the church, as well as pointing out many of the items reused from closed churches in the archdiocese. 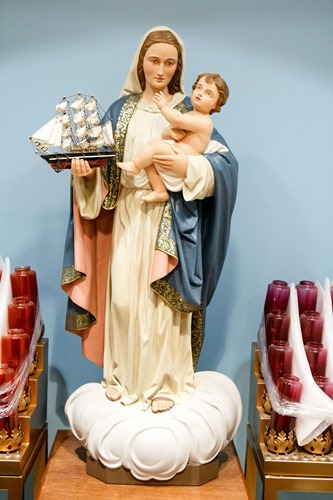 One of the new elements that I particularly admire is the statue of Our Lady of Good Voyage, which was made in Oberammergau, Germany. 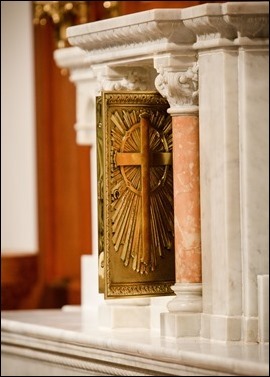 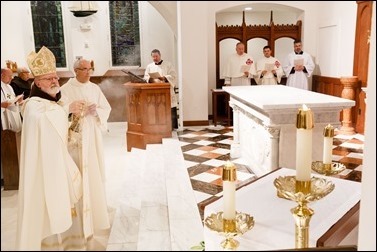 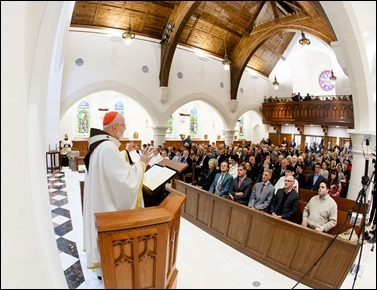 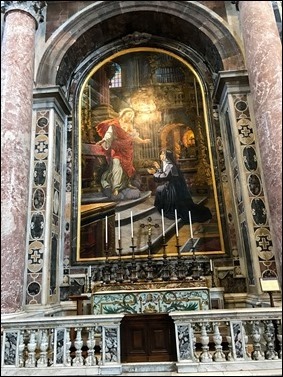 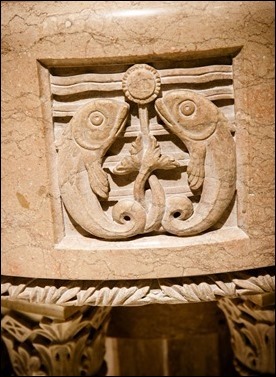 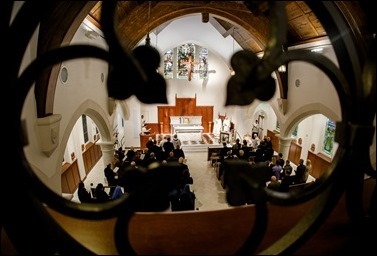 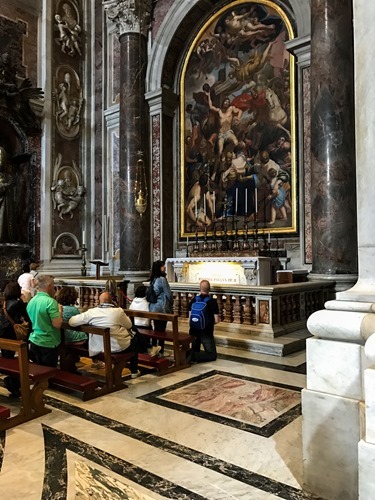 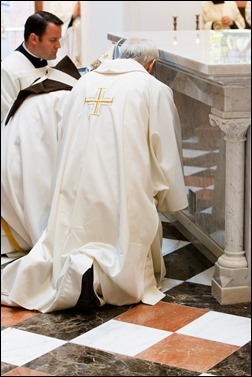 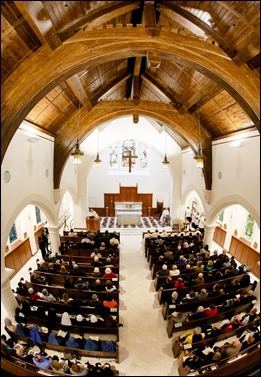 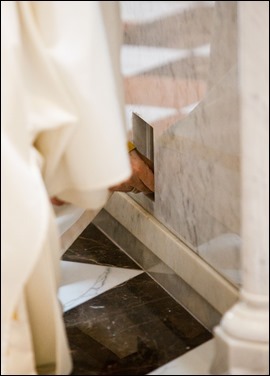 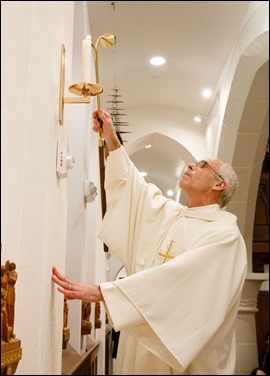 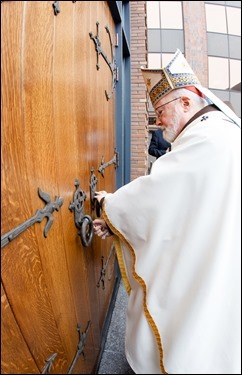 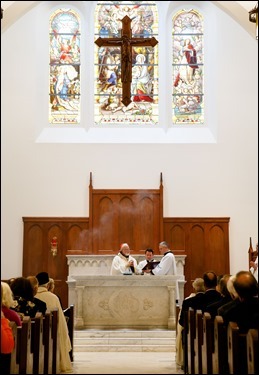 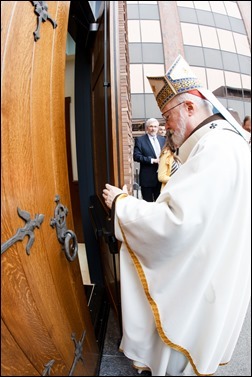 Of course, the Mass of the dedication of the church itself is very beautiful, with a great amount of symbolism, including the unlocking of the door, the procession into the church, the anointing and incensing of the altar, the anointing of the walls and the lighting of the candles around the church. 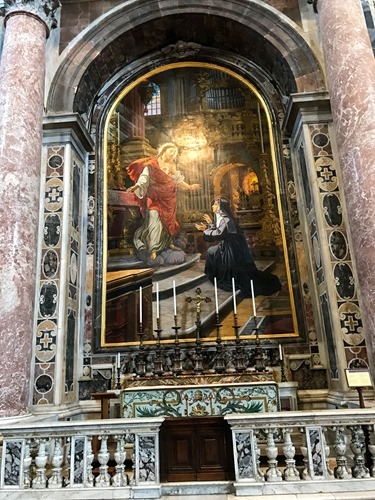 The choir director from St. Cecilia’s in Boston brought together a wonderful choir for the Mass, and their singing was just stunning. 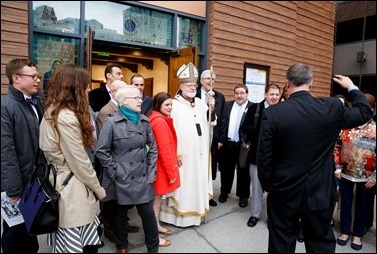 I greeted them following the Mass and they gave me a sort of impromptu serenade, which was quite a treat. 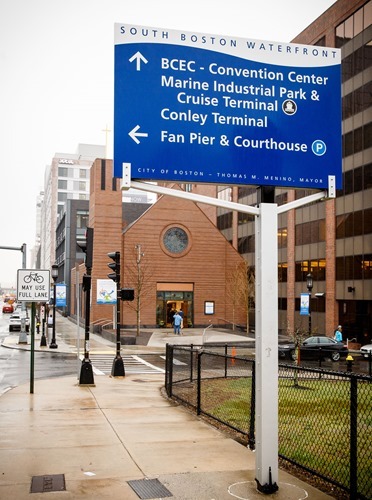 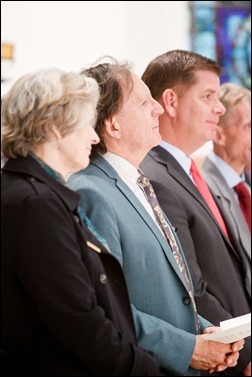 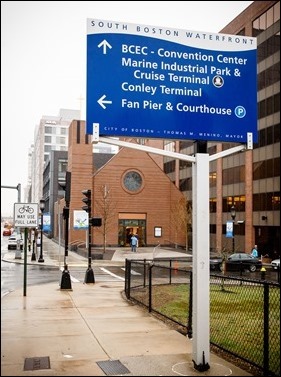 We are so encouraged that this project has garnered so much interest among the public and that The Boston Globe and many other local media outlets reported on its opening. 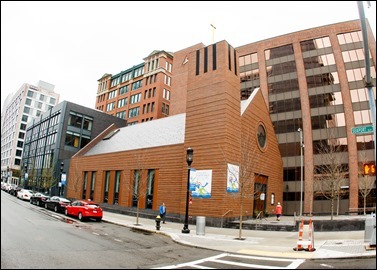 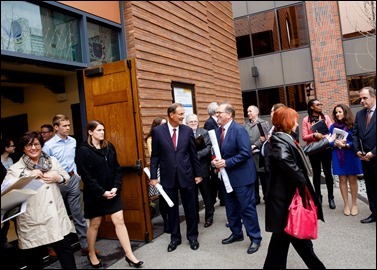 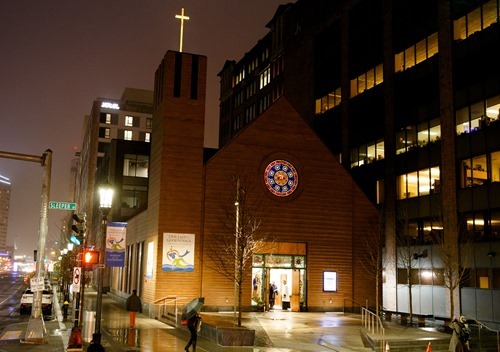 Though the Seaport District has a very long history, in many ways, this is really a new neighborhood in the city, and we see this church as playing a very important role there. Many of the new residents are young professionals, and we hope to have a very strong outreach to them at the shrine. We are delighted that even before we opened the doors of the shrine, 35 couples have already scheduled their weddings there. 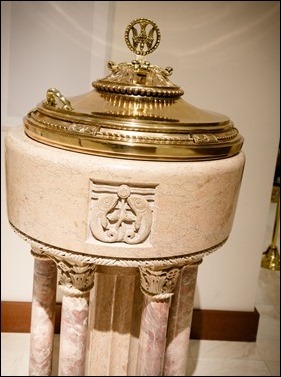 In my homily, I mentioned that among the relics that we placed in the altar where those of St. Anthony of Padua, not only because he preached to the fishes but also because his is the saint that women pray to when they are looking for a husband. Because we are having so many weddings there, we thought that would be very appropriate! 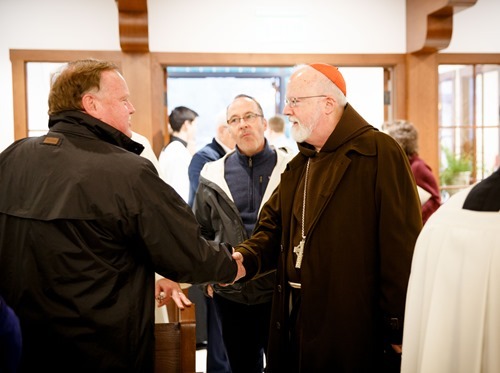 On Sunday, I departed for Rome for our April meeting of the Council of Cardinals advising the Holy Father. 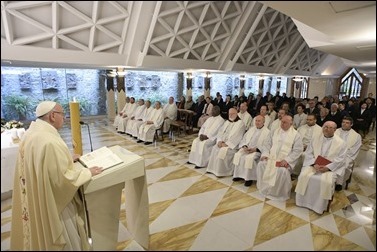 We met Monday through Wednesday, and on Monday we joined the Holy Father for Mass at Casa Santa Marta. 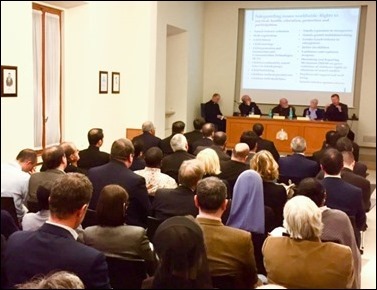 This time, during our meetings we reviewed the work of several offices of the Curia, particularly Propaganda Fide and the Pontifical Council for the Promotion of the New Evangelization. 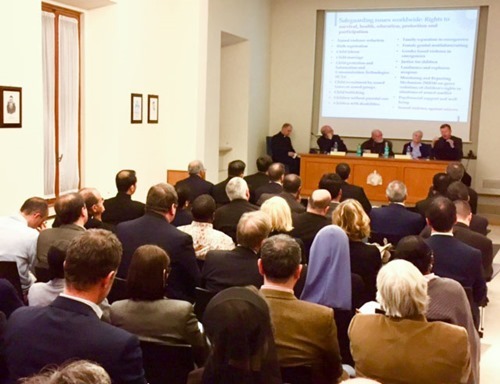 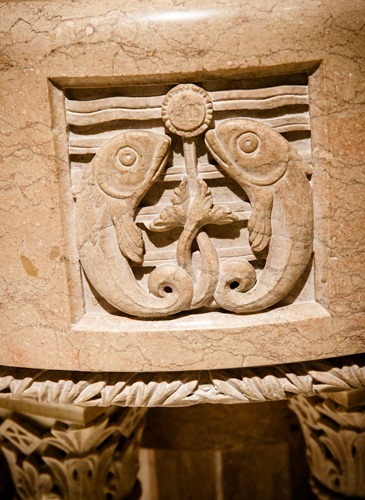 We also reviewed some materials regarding the Pontifical Council for Interreligious Dialogue, the Pontifical Council for Legislative Texts, as well as three tribunals: The Apostolic Penitentiary, the Apostolic Signatura, and the Tribunal of the Roman Rota. We also discussed the relationship between the episcopal conferences and the Roman Curia. 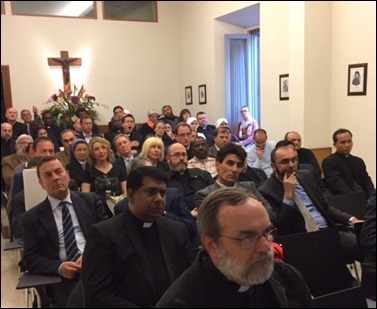 In addition, I had the opportunity to update the council on our efforts at the Pontifical Commission for the Protection of Minors. 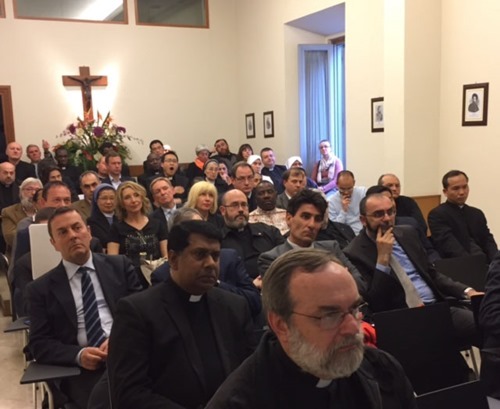 As I always like to do, I took occasion of my time in Rome to meet with different people. On Sunday evening I had dinner with Bishop Peter Uglietto and Father Bill Palardy, who happened also be in Rome. 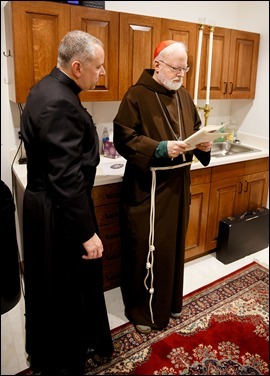 On Wednesday evening, I had dinner with Father John Pavlic, OFM Cap. 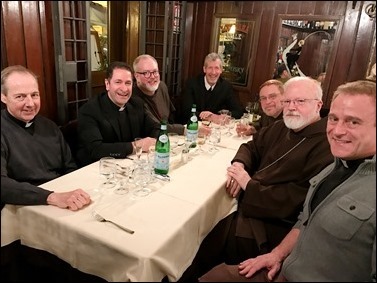 and the other members of the executive committee of the Conference of Major Superiors of Men Religious in the U.S., who were in Rome for meetings. 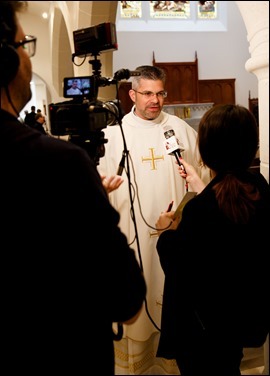 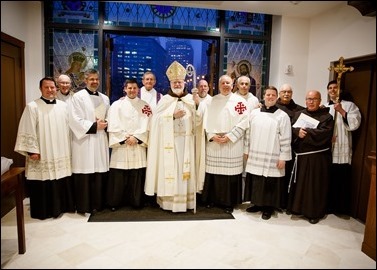 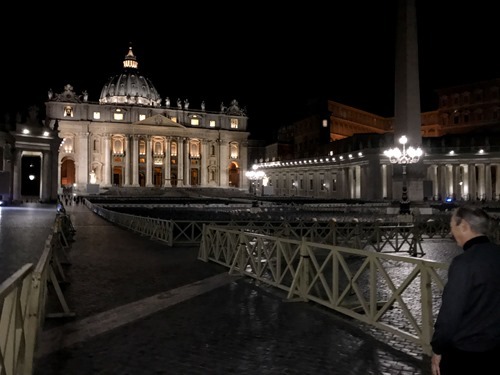 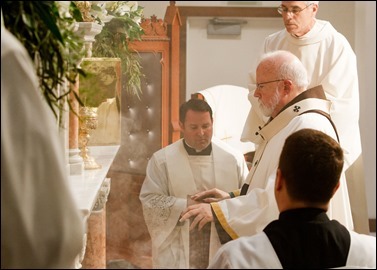 Each year, the executive committee makes a sort of “ad limina visit” to the Holy See, where they meet with the various dicasteries that impact the life of male religious priests and brothers in the United States. 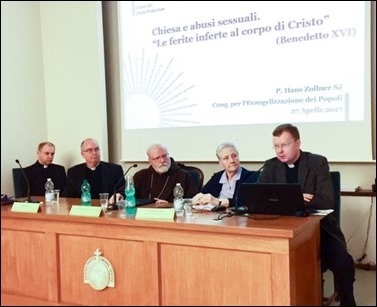 Thursday, after the meeting of the Council of Cardinals ended, I led a presentation on child protection for a very large group of priests, sisters and lay people of the Congregation for the Evangelization of Peoples, which is in charge of the missions. 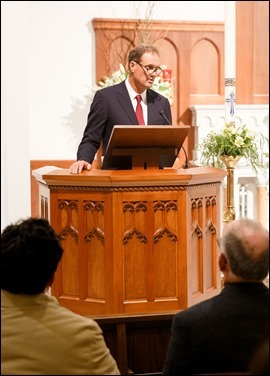 Afterward we held a question and answer period. 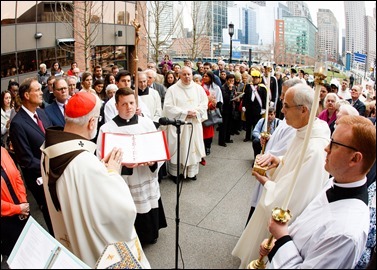 I think it was a very profitable event. In addition to myself, the panel included Father Hans Zollner SJ, Msgr. 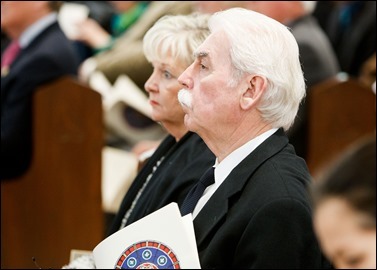 Robert Oliver and Marie Collins. 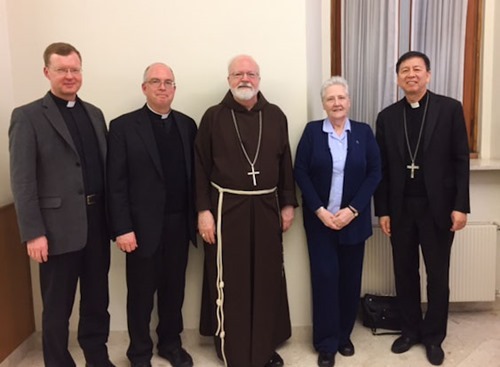 Although we are very sorry to lose Marie Collins from the commission, we are so pleased that she was present and is willing to help us in the very important task of trying to bring formation on the issue of child protection to Church leadership, particularly the new bishops and those who work in the various departments of the Holy See. 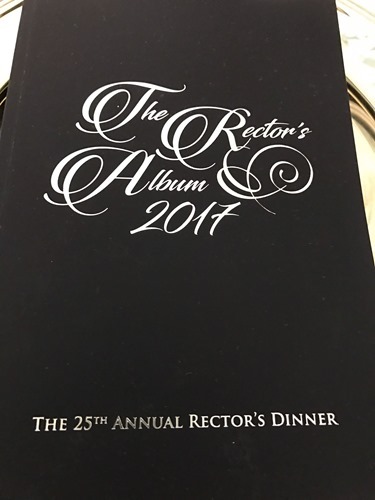 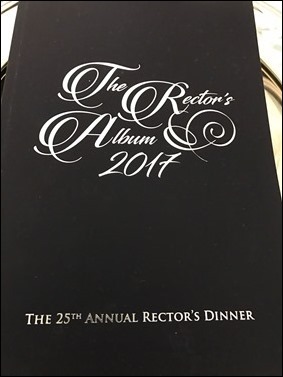 Thursday evening I was very pleased to be able to join the 25th Annual Rector’s Dinner at the Pontifical North American College, hosted by Rector Father Peter Harman. 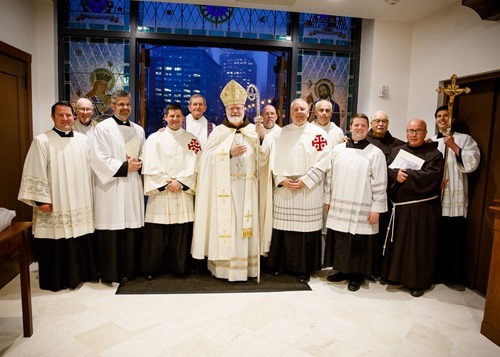 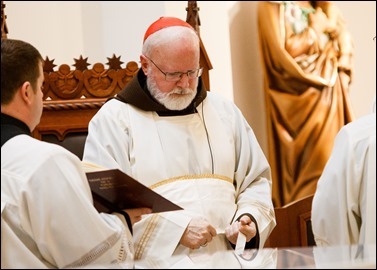 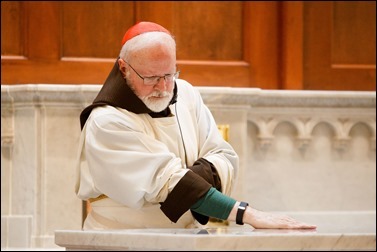 Many of the Cardinals of United States were there, as well as many priests, including our own Father Michael Drea. 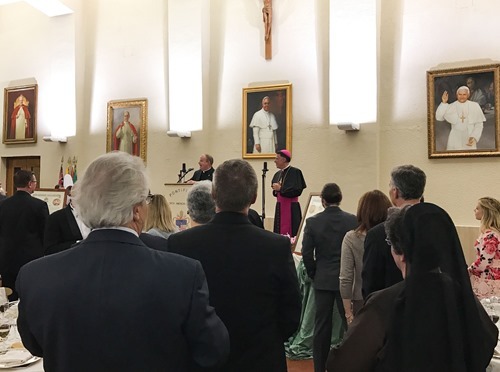 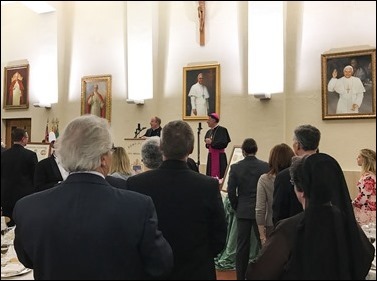 During the dinner they honored Bishop Jim Checchio of Metuchen, N.J., who is himself a former rector, as well as Mr. and Mrs. Robert Weber of Florida. 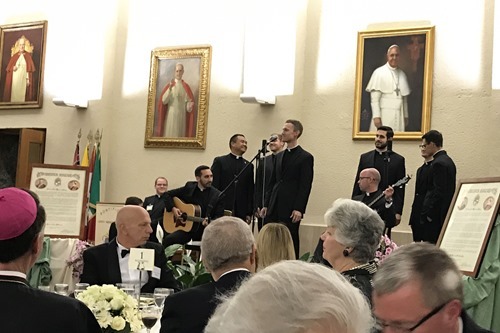 The seminarians provided us entertainment with singing, which was very well done. Today, as I make my trip back to Boston, the Holy Father has just arrived for his very important pastoral visit to Egypt, where we hope that his presence will bring healing and encouragement, especially to Christians who are suffering so much in the country. 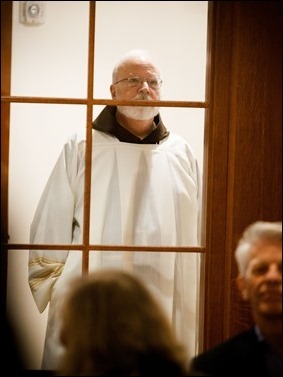 Let us all pray for him and that his visit may bear many fruits!